All members of the UCC community were invited to attend the UCC Association annual general meeting and to hear the board of governors report to the community on Oct. 12, 2011. 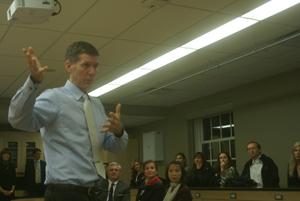 Under discussion was the topic of what makes a world-class school even greater. A well-rounded program, high academic standards, a global perspective and a motivating environment are all critical factors that distinguish a world-class school from others, and ones that Upper Canada College has built its international reputation upon for the last 185 years. Based on those elements alone, UCC ranks among the most elite schools in the world — with one important difference. Schools such as Andover, Eton and Exeter provide financial aid to 30 to 55 per cent of their students. We’re not even close to that, although we’ve taken the first steps. • In 2011-12, we increased our overall number of students on financial assistance from six per cent to eight per cent, allocating a total of $2.1 million towards needs-based scholarships. • Scholarship availability has begun in Grade 5 instead of Grade 7. Upper Canada College’s annual general meeting and board report had a new twist in 2012, as tours of new classrooms were provided afterward. Outgoing Association Council president John Cape ’87 opened the proceedings by outlining highlights from the past year and pointing out upcoming events before he introduced his successor, Jim Garner ’77. These people were elected to the Association Council: Michael Carmichael ’97, parent of John ’24; Carolyn Everson-Irwin, parent of Andrew ’15; Matthew Flynn ’96; Liza Murrell, parent of Nolan ’21 and Sabastian ’16; Chan Sethi ’03; and Johanne Dotsikas, parent of Ethan ’20 and Ryan ’14. Principal Jim Power spotlighted more school and student accomplishments, and board of governors chair Andy Burgess ’83 talked about the priorities of the $100-million Think Ahead fundraising campaign and the advertising being used to promote the needs-based scholarship program. It was also announced that Lincoln Caylor ’87 was added to the board. UCC governor Russ Higgins ’81, who was appointed to a second three-year term, went into greater detail about upgrades to Upper School and boarding house facilities that a portion of the Think Ahead funds are paying for. He said the College has just completed the second year of a 10-year, $43-million renovation program and invited those in attendance to see some of the results for themselves. Richard Wernham & Julia West Centre for Learning executive director Mary Gauthier welcomed guests to room 308 and explained ways that UCC is trying to create optimal learning environments for boys, including designing flexible spaces, using soft colours, installing carpets and replacing old desks with new tables, among other things. Facilities executive director Steve Thuringer described less obvious but equally important infrastructure improvements, including the installation of new ductwork, lighting and windows. Science teacher Reed Jeffrey pointed out the advantages of the science labs built this summer over the older ones his department has been using. Boys can now work in groups easier and write notes on bench tops that can be erased afterward. Rooms can be completely blacked out, storage and floor space are used more efficiently, and non-slip floors and other safety measures have been introduced. Judging by the conversations at a reception in the student centre after the tour, people are impressed with the changes and believe that the board is on the right track as it thinks ahead to come up with ways to make UCC the best school possible. The Upper Canada College Association Council annual general meeting and board report drew about 60 interested people to the Wilder Arena’s Hewitt Lounge on Oct. 9 to hear about the school’s achievements and challenges. Association Council president Jim Garner ’77 talked about Association Day, Founder’s Dinner, 13 branch events held across Canada and internationally, a number of Old Boy events, the Common Ties Mentorship Program, the MeriTALKracy project, the Association Council mandate review, the Norval 100th anniversary picnic, the John D. Stevenson Award and the Harold A.D. Roberts Circle Award. Garner also announced that UCC governor Kathy Martin was re-elected to a second three-year term on the Association Council and that Neil Seeman ’88 has replaced John Medland ’97 after his six-year term on Association Council came to a close. Principal Jim Power mentioned the “overwhelming sense of community” he felt at Association Day and other UCC events over the past year, and his enthusiasm carries over to students. He cited that 99 per cent of the 2013 leaving class received the International Baccalaureate Diploma, boys’ exam results continue to stand well above the world average, and that students received a wide variety of academic, athletic and extracurricular medals and awards over the past school year. He was also pleased to announce that just under 80 per cent of all admission offers the College made were accepted, which is up more than five percentage points from previous years. Power mentioned some of the generous gifts to the Think Ahead campaign, which has now raised $80.8 million, including the $11-million donation from Stu Lang that was showcased on Association Day. Power illustrated how UCC is evolving by highlighting the $3.7 million allocated to financial assistance that’s enabling 170 boys — 15 per cent of the student body — to attend the school this year. Board of governors chair Andy Burgess ’83 first acknowledged the contributions of Lou Pauly, who completed his term on the board this past summer. This meeting marked the final event of the governors’ annual day-long retreat, during which they discussed UCC’s strategic plan, the school’s progress and governance, and the road ahead. The board’s mandate is to ensure the long-term success of UCC, and Burgess said that appointing Power to another five-year term is a big part of that. Burgess emphasized that the board strives to keep tuition fees as low as possible and that the average annual tuition increase over the last five years has been 2.9 per cent — which is among the lowest in the independent school sector. Tuition and fees for services cover 78 per cent of the total cost to operate UCC, with the difference made up by other sources, such as donations. Burgess summarized the progress being made with the seven pillars of the strategic plan, including: the expansion of advising programs; greater student involvement in co-curricular programs; faculty professional development; the revitalization of the boarding program, which this year includes boys from 20 countries; increased financial assistance; facility renovations; and the Think Ahead campaign. Garner returned to the stage to talk about the launch of UCC’s global leadership initiative, which has been kick-started by a $1-million donation from an anonymous Old Boy and will focus on internationalism. The program is the first of its kind in Canada and will dovetail with the College’s character development initiative headed by Steve Dubrick, which received $1.25 million in seed funding from anonymous UCC parents. The evening concluded with Burgess and Power taking questions from audience members.